Guys. How do we even handle this cheesiness?! It’s intense. Over the top. Outrageous! And it’s all covering a green vegetable which means it’s actually good for us. YESSS. Cheesy zucchini roll-ups are where it’s AT. This is a recipe that I’ve been making for an entire YEAR now and have yet to share. If you followed me on instagram or even snapchat last summer, you saw it allllll the time. It was my go-to way to get in a veggie. And an excuse to use an enormous amount of cheese. When I was planning out my videos for DeLallo’s, I knew that we had to share the roll-ups because theirs is the only sauce I ever use! I’m obsessed with the Pomodoro Fresco Marinara. Eddie ends up buying four or five jars each weekend and if I’m in a pinch, I’ll use it for pizza too. SO GOOD. By the time we shot the video last year, it was nearing September and I was too afraid that most of the good garden zucchini was on its way out, so I kept it for this year when we could be in PRIME zucc time. This is one of our favorite dishes, period. I say dishes, because for Eddie it is more of a side dish but for me, it can easily be an entire meal. As soon as this comes out of the oven, I cannot even STAND to wait to take a bite. The golden, bubbly cheese on top? Ugh. So freaking delish. So yes, the trickiest part is slicing the zucchini thinly enough so you can roll it up without it breaking. A few pieces may break and that’s totally fine! But ideally you want super thin strips so we can pack it with cheese and sauce. And hopefully still serve it in adorable little roll ups. Also! You can totally add meat or sausage to the inside of these roll-ups too. I choose not to because I just don’t love either, but Eddie loves them even more bulked up. Have we seen enough cheese yet? Okay wait! One more cheese pull. Just one. Preheat the oven to 425 degrees F. Spray a 9×9 inch baking dish with nonstick spray. In a bowl, combine the ricotta, provolone, parmesan and italian seasoning. Mix until combined. Place a tablespoon or so on each slice of zucchini and carefully roll each up, placing it in the baking dish. If your zucchini breaks – no big deal! It will still come out great. Repeat with the remaining zucchini and ricotta. I like to put 9 to 12 pieces in this dish, based on the size of the zucchini. If you want to make a 9×13 dish, I would double (at least!) the ricotta mixture. Cover the zucchini with the marinara sauce. Top with the mozzarella cheese. Bake for 20 to 25 minutes, until golden and bubbly. You can broil that last minute for more bubbliness! Remove it from the oven and top with extra fresh parm and the fresh herbs. Serve immediately, just remember – it’s hot! Annnd now we’re done. That’s enough cheese. If there is such a thing. YES! A healthy excuse to eat cheese! No wonder you ate it all the time!!! I will be now! thanks emma! it’s so good! I’m petty sure I’ve been asking you to share this recipe since last summer! I remember you posting and wanting to know how to make it! Adding it to my list this week. I can’t wait for my zucchini now!! This cheese is the most beautiful sight I ever did see! I’ve only ever done this with eggplant! I can’t wait to try it with zucchini! thanks emily! i’ve never tried with eggplant. i need to. hi noelle! did you use the code sweet25? we just updated it this morning so it should give 25%! Hey Jess, the coupon code is still only giving 10%. this is so beautiful. in love. Oh my, here’s a great looking recipe, with all that cheese that we love and there’s no zucchini in the garden this year! I don’t typically see any that are 9-12 inches long in the market. Any thoughts on how to use the smaller zucchini that are available the stores or farmers market? Thanks! i think you can def still use them! as long as they fold over once, you’re set! That threw me at first, too, then I realized she meant 9 to 12 long slices – as in, quantity, not length. So 9 to 12 slices of zucchini. I’m still stuck on figuring out what the “square” modifier on the zucchini means, though, hahaha! This is literally the meal of my dreams. I just went to DeLallos today and bought 3 jars of this sauce! Somehow I always end up with extra zucchini in my fridge every week (this week that would be 3!) and I can’t figure out how because I really do love every member of the squash family. This is an awesome way to use up those extras on a Saturday night in! thanks lindsey! i hope you try it. Yum! This looks like it will be making an appearance on my dinner table this week! 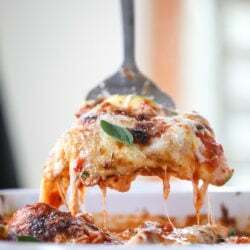 The video shows adding what look so to be more shredded provolone and mozzarella to the zucchini slices after spreading them with the ricotta mixture. Right?? The recipe does not indicate this. I personally would follow the video and add the extra cheese to the roll ups regardless!! I’m glad I watched the video (I usually don’t) because the extra cheese looks like it makes the roll ups even better!! This looks so good! Is it possible to sub an equal amount of cottage cheese for the ricotta? Can’t wait to try it. Thanks! i think you probably can! i don’t really care for cottage cheese so i don’t have a ton of experience cooking hot dishes with it, but i don’t see why not! Made this tonight & it wasn’t gobbled up by both my husband & toddler! It was quite a bit more runny than yours (probably from the zucchini releasing liquid), but we loved it just the same! Thanks for providing a yummy recipe for the over-abundance of zucchini in my house right now! OMG *WAS* most definitely WAS gobbled up! Have you tried freezing this? Before or after baking? Made this tonight and it was Delicious!! I used a mandolin to slice the zucchini thin and they rolled up beautifully. Put it all together early in the morning and refrigerated it during the day. Popped it in the oven in the evening and dinner was ready in 30 minutes. My family Loved it! Thank you for a beautiful recipe. Super yummy recipe. I am a big fan of cheese.